Combination of atrial septal defect (ASD) and mitral stenosis (MD) is defined as Lutembacher syndrome (LS). MD is mostly acquired (rheumatic heart disease), as congenital MD is very rare. The percutaneous interventions for MD have become widespread. The ASD may become either congenital or iatrogenic. The coexistence of spontaneous or iatrogenic ASD and acquired MD is known as acquired LS. Here, we report a case of acquired LS. Congenital atrial septal defect (ASD) and rheumatic mitral stenosis (MD) was first reported in a female patient by Lutembacher in 1916(1). Lutembacher syndrome (LS) occurs as a rare combination of congenital secundum ASD and an acquired MD(2). Hemodynamic effects of these two diseases are very interesting. ASD decreases left atrial pressure and mitral valve gradient while MD increases the left to right pass due to ASD. The wide range of ASD plays a role in the relief of symptoms related to MD. The widespread percutaneous interventions have increased this rare combination. We present a 48-year-old woman with a previous percutaneous mitral balloon valvuloplasty (PMBV) history. A 48-year-old female patient was referred to our cardiology clinic with dyspnoea and quick fatigue. Patient history showed PMBV for rheumatic MS in 2014 and hypertension. At the first evaluation, her blood pressure was 110/65 mmHg, and his heart rate was 98 bpm, respectively. Physical examination revealed a systolic murmur of 3/6° in the mesocardiac area and a diastolic murmur of 3/6° in the apical area. Twelve-lead-electrocardiography showed atrial fibrillation. Transthoracic echocardiography found that the left ventricular ejection fraction was preserved, and revealed calcified and thickened mitral valve, mild mitral regurgitation, moderate tricuspid regurgitation with a pulmonary systolic pressure of 40 mmHg and suspicious view at interatrial septum. Mitral valve area was 1.2 cm2 according to the pressure half-time method. To minimize the risk of miscalculations due to decreased left atrial pressure we also calculated as 1.3 cm2 with the planimetry method. The mean diastolic transvalvular mitral valve gradient was 7 mmHg. There was no information about ASD in previous echocardiography reports. 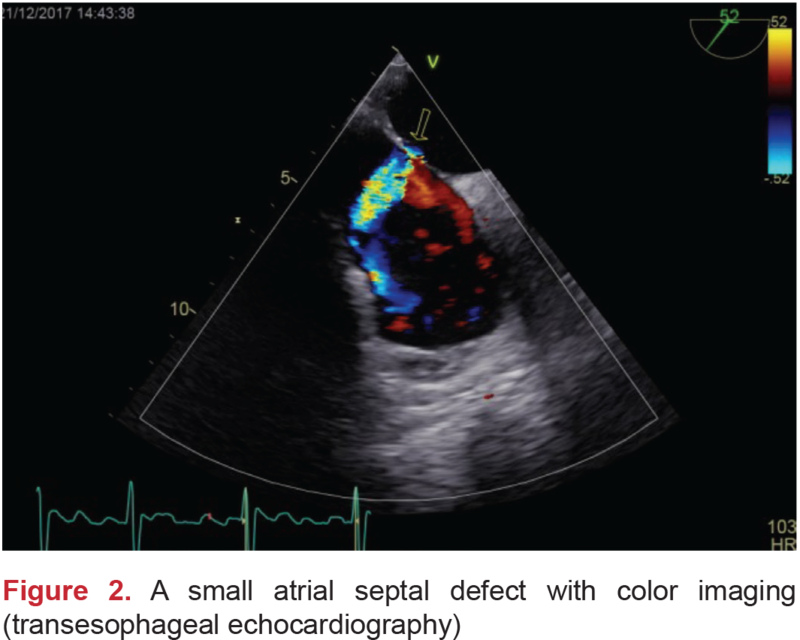 Transesophageal echocardiography (TEE) was performed to the patient because of the suspicious view at interatrial septum. 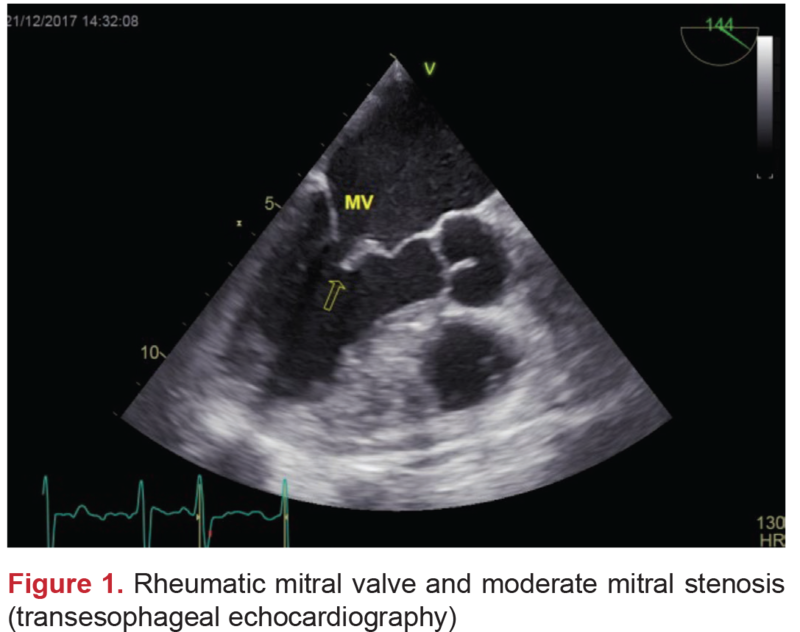 TEE revealed rheumatic mitral valve and moderate MD (Figure 1). 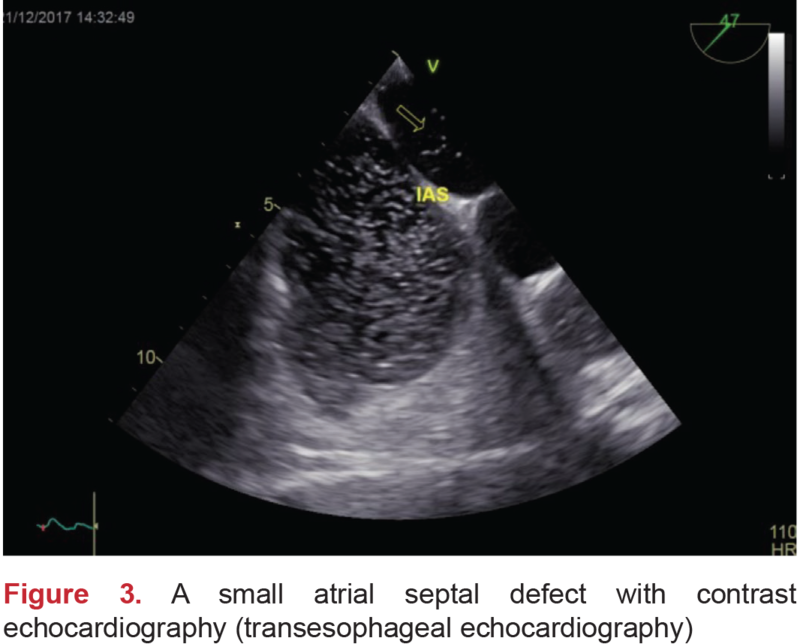 A small ASD was observed in the 2D TEE and contrast echocardiography (Figure 2 and Figure 3). ASD defect measured 6 mm. Having a history of PMBV no information about ASD in previous report and this new evidence was diagnosed with acquired LS. This is thought to have arisen iatrogenically due to PMBV in 2014 and/or spontaneously due to extreme tension of the left atrium. We took the patient to medical treatment and intensive follow-up. LS can be defined as the combination of ASD and MS. Since both ASD and MS are frequently found in women, LS also occurs more commonly among women(3). Hemodynamic associations between ASD and MS are clinically challenging. As in LS, one can change the clinical and hemodynamic effects of the other. His is due to ASD diameter, severity of MD and right ventricular function. The coexistence of MS and ASD has a distinct course as compared with isolated MS. The existence of ASD in an MS patient, can mimic the symptoms and auscultatory findings of the disease. Increased left-atrial pressure due to MS, increases the left-to-atrial shunt, causing early right-heart failure and pulmonary hypertension. The spread of percutaneous interventions for MD and the occurrence of iatrogenic disorders associated with these interventions led to different definitions for the disease. This condition, “acquired LS”, may result from two different scenarios. In the first scenario, in isolated MS patients, an “iatrogenic ASD” may occur due to PMBV, which is performed through atrial septal puncture by the transseptal approach(4). The second scenario for “acquired LS” is spontaneous secundum type ASD development due to progressive left-atrial enlargement and pressure over load in the presence of severe MS(4). If LS is diagnosed early, it is a good prognosis. Patients hospitalized for right-sided heart failure and pulmonary hypertension give excellent results in survival following mitral valve replacement and ASD closure. The object of this case is to remind the clinical variations of this rare syndrome, to better understand the echocardiographic findings and to keep this diagnosis in mind when evaluating patients. Surgical and Medical Practices: Ç.K., Concept: Ç.K., S.A., Design: Ç.K., M.G., Data Collection or Processing: Ç.K., S.A., M.G., Analysis or Interpretation: Ç.K., S.A., M.G., Literature Search: Ç.K., S.A., M.G., Writing: Ç.K. Perloff JK. A Trial Septal Defect in the Clinical Recognition of Congenital Heart Disease. 4th ed. Philadelphia: WB Saunders; 1994. p.233-99. Nagamani AC, Nagesh CM. Lutembacher Syndrome. Chapter 64.In: Vijayalakshmi IB, Syamasundar Rao P, Chugh R. editors. A Comprehensive Approach to Congenital Heart Diseases. 1st ed. India: Jaypee Brothers Medical Publishers; 2013. p. 908-16. Perloff JK. The Clinical Recognition of Congenital Heart Disease. 4th ed. Philadelphia: WB Saunders; 1994. p.323-8. Ananthasubramaniam K, Iyer G, Karthikeyan V. Giant left atrium secondary to tight mitral stenosis leading to acquired Lutembacher syndrome: a case report with emphasis on role of echocardiography in assessment of Lutembacher syndrome. J Am Soc Echocardiogr. 2001;14:1033-5.